When a whiskey-addled Van Morrison first belted out the above lyrics in 1967, he was trying to come to terms with a long-ago love—a brown-eyed girl obliging enough to give him quickies behind some East Belfast stadium, apparently. Yet Van was also celebrating the giddy 1962 high of realizing that, thanks to the wizards at Texas Instruments, Sony, and other electronics titans, you no longer had to hang at your parent's house in order to enjoy some choice AM nuggets. You could, indeed, play music while drinking beer down the old mine. The only prerequisite was a pal rich enough to buy a cheap Japanese transistor radio, which ran around $20—$123 or so in today's dollars. 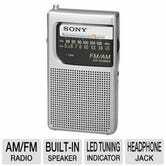 A transistor radio nowadays, of course, is about as low-end a gadget imaginable—the Sony pictured at right goes for less than $13, putting it well within the price range of just about everyone. But who buys transistor radios anymore? Tell a girl that your idea of the perfect date is pumping Hot 97 on a Sony ICF-S10MK2, and your odds of removing her pants someday descend to absolute zero—what a simpler time you grew up in, Van. Still, the likes of Sony and Panasonic ain't dumb, and there's obviously a market for these things. 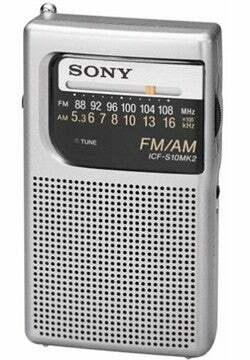 So who's keeping the transistor-radio fires burning, and are they an endangered species? Read on, brothers and only friends, read on. PLUS: GSM phone recs for a reader headed for the Middle East? The Paranoid At least two, and possibly three, generations of electronics consumers were raised to believe that any bomb-shelter or disaster-preparedness kit should include a transistor radio. I can clearly remember learning this in elementary school, when everyone quite earnestly believed that a nuclear exchange with the Soviets was right around the corner—don't laugh, young'uns, until you consider what it must've been like to see The Day After as a nine-year-old. The idea was that, in the event my hometown of Los Angeles was turned into an apocalyptic wasteland rife with looting and zombies, our family would be able to receive news updates regarding just how screwed we really were. Don't get me wrong, I sort of get this mindset—in the event of a true catastrophe, it'd be nice to know where I might be able to snag a Red Cross meal, or which highways are still open. But given the abundance of multi-function gadgets that feature AM/FM capabilities—a lot of digital audio players, for example—should I really invest in a dedicated transistor radio just for emergency purposes? Anyone who grew up during the Cuban Missile Crisis probably disagrees with me, though, which is why I'm willing to bet a lot of transistor radio buyers are on the north side of 50—and probably still quite leery of a Soviet comeback. Baseball Fans I actually saw the Panasonic RF-P50 (below right) advertised expressly for this market—the radio was in the window of a discount electronics store on 14th Street, above a star-shaped sign reading "Great for the Ballpark!" Again, I don't see the wisdom in buying a radio-only unit like the RF-P50 when, for a few bucks more, you can get the radio capabilities integrated into a more versatile gadget. But aging baseball fans who grew up marveling at fellow spectators listening to the radio broadcasts? For them, there's still something magical about the humble transistor radio and the one-piece earphone—it's as much a part of the going-to-the-ballpark experience as 64-ounce beers and paying $29.95 for parking. Plus, if some drunken fan knocks your RF-P50 to the ground by accident, no worries—it's only $13, which is about what it costs to buy a hot dog at Shea Stadium nowadays. Hopeless Radio Geeks The Japanese word otaku deserves far more usage in the West—we English speakers don't have a similar word that so succinctly conveys the obsessive jags of some smart-yet-maladjusted folks. Like trainspotters or model-railroad enthusiasts, radio geeks have a curious fixation on everything to do with the RF portion of the electromagnetic spectrum. That usually means ham radios and the like, but there continues to be an inexplicable fascination with low-end gear, too. Countless forums are filled with comparison tests between $10 transistor radios and pricier living-room units, with the former often winning the Battle of Reception. Believe me, there are few happier souls on this planet than the radio geek who just discovered he can pick up an FM station in a different time zone if he adjusts the antenna on his transistor unit just like so. What's the common thread between all these consumers? I've gotta say it's age—I just don't think you're going to see many under-30s buying transistor radios. That's in large part because radio is a common feature on MP3 players and Walkmen knock-offs, but also because there's no wow factor in the technology—in the era of the baby cellphone, getting AM/FM reception for twelve bucks ain't all that. Kinda sad, as the Van Morrison lyric at this column's top so neatly encapsulates the thrill of technology, a thrill that seems pretty hard-to-come-by in today's more electronics-saturated world. I mean, is there a "Brown Eyed Girl" of the iPod Era, a song that conveys the high of that first time you realized you could fit 4,000 songs in your pocket? Tips in comments or via e-mail, please. to travel with?" I'm both too cheap and too lazy to pass along any worthy advice, so I'm leaving it up to y'all—leave tips in comments.